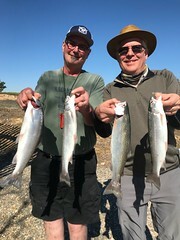 Return client Joe brought along his friend Norman for a day’s fishing at New Melones on September the 21st. Joe likes a later start to the day and we met at the dock at 10:00 and headed out. The day was cloudy and cool as it had rained the night before. After setting four lines we started our day of fishing, it did take a while to get out first hoo-up and it was landed. I wasnt expecting a great bite as sometimes the better bite is in the early morning hours, however this day would prove different. We never had a great bite, however it was some what steady and the day stayed cool for us all day that was very welcome. We had a couple missed opportunities, the biggest fish of the day was a five pounder caught by Joe. 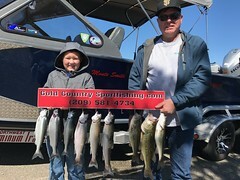 The day turned out great for these great guys as the landed seven nice rainbows from the waters of New Melones. The photo shows the best four of seven fish. Thanks again guys!!!! 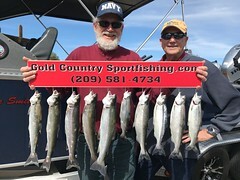 This entry was posted in Gold Country, Gold Country Sport Fishing, Melones, New Melones, New Melones fishing guides, Rainbows. Bookmark the permalink.